What do “Licensed,” “Bonded,” and “Insured” Mean? When the time comes and you need a service done at your home, you probably take some time to search for the right person. You don’t just want any old person to come into your house and mess around with your electric system, plumbing, or other systems. You want someone who is trained and who you can trust. You may have heard the term “licensed and bonded” when referring to these types of skilled laborers. You may remember our past post that defined these terms. There’s also another term that floats around when it comes to skilled laborers, and that is “insured.” So, you may have an idea of what each of these terms means, but if you don’t or you want a refresher, read on. “Licensed” is probably pretty obvious already. Think of it like your driver’s license. You had to train and take a test to prove your ability. Being licensed means that a worker has trained in what they are going to do, and they have usually taken a test for that license which proves that they are qualified to work in that field. Being licensed is definitely important – you want the people working in your home to have training in doing that work and to be qualified to do that work. “Bonded” is a different story – this term is not quite as common. To best describe this term, we’ve turned to Angie’s List which provides an excellent definition: “Bonding protects the consumer if the contractor fails to complete a job, doesn’t pay for permits, or fails to meet other financial obligations, such as paying for supplies or subcontractors or covering damage that workers cause to your property.” So, in essence, having a bonded worker is extra assurance for you. If something goes wrong, this bond provides peace of mind for you and that’s important. There’s also “insurance.” This one is probably also pretty clear because you’ve heard of car, home, and health insurance, among others. Insurance protects both you and the skilled laborers coming into your home. If something happens to your house or to one of the workers, insurance helps to cover that damage. If the skilled laborer is not insured, that cost could fall on you. 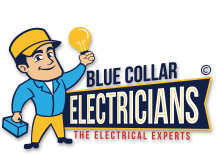 When you need an electrician, make sure you consider Blue Collar Electricians.